Because wood painting appears to be such an elemental, foolproof project, many people rush the job along or attempt shortcuts that produce poor results. Plus, with the advent of paint-ready surfaces like drywall and primed trim and casing, wood painting is slowly becoming a lost art. Learn how to master the techniques of high-quality painting of wood surfaces, and transform yourself from an amateur weekend painter to a professional-quality painter. Drape plastic sheeting over every surface that will not be painted. This includes but is not limited to flooring, furniture, radiators, adjacent walls, desks, and tables. Small pieces, such as lamps, hassocks, and area rugs, should be removed from the room entirely. Lay contractor's paper or a canvas drop cloth over the plastic sheeting in areas where you will be walking. Secure the plastic with painter's tape. Mix the TSP (or TSP substitute) with lukewarm water to the proportions recommended by the manufacturer. Dip a rag in the water, firmly squeeze it dry, then wipe down the surface to remove all oils, dirt, and grime. Rinse the area with clean, warm water and a clean rag. Sand the wood with a fine-grit #180 paper, wearing a dust mask or respirator. The intent is not to strip the wood of all of the coatings and stains but simply to smooth out the surface and provide some "tooth," or slight scratches, to help the paint bond. If you are sanding furniture and other pieces that have uneven surfaces, switch to hand-sanding so that the sandpaper can better conform to the shape of the piece. After sanding, thoroughly remove the dust from the surface. Begin with a shop vacuum outfitted with a brush attachment. Do not use a blower, as this will only redistribute the dust back on the surface. After you have removed a majority of the dust with the shop vacuum, use a tack cloth or a cotton rag that has been dipped in water and thoroughly squeezed out to remove the remainder of the dust. Mix the primer well and apply it with a brush or roller. After drying, if the primer looks transparent on the wood, prime a second time. Primer will have a chalky feel and appearance, but this will be smoothed over by the paint. Because of primer's uneven texture, it is necessary to sand it down before painting. Use very fine #220-grit sandpaper, and apply light pressure to prevent gouging the primer. Remove the primer dust with a quick brush from the shop vacuum, followed by a light swipe of the tack cloth. For highly irregular surfaces, such as furniture, crown molding, and trim, it is best to use a paintbrush only. For surfaces that have large, flat components, incorporating a high-density foam roller will help you get the job done more quickly. Dab the end of the paintbrush bristles only about 1/4-inch into the paint each time you load the brush. Transfer the paint to the wood, dragging the brush in short strokes that run parallel to the wood grain. Keep a wet edge at all times to prevent lap marks. Do not add a second coat of paint during this step, as this can cause the paint to tear. For painting with the roller, insert the paint tray liner in the paint tray, then pour about 4 ounces of paint in the tray. Gently dab the roller into the paint. Roll the paint up and down the slope of the tray a few times to distribute the paint on the roller pad. Transfer the roller to the wood. Roll the paint onto the wood, beginning with light pressure only. High-density foam roller covers tend to trap paint in the roller pad, so you may have to gently increase pressure to release the paint. 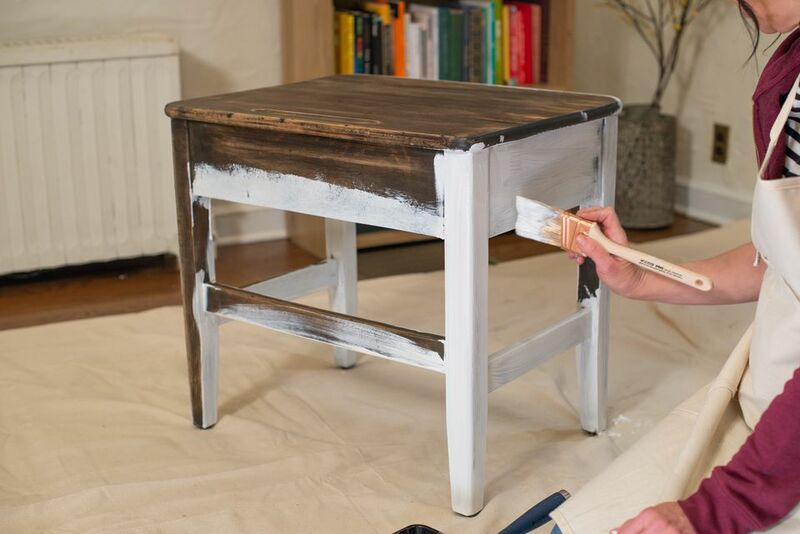 You can usually achieve an even smoother coat if you opt to sand and paint one final time. Sanding your previous paint coat brings down bumps and inconsistencies introduced by the roller or brush. Use a very fine grain sandpaper, such as #220 grit. Attach the paper to the orbital sander and run it extremely lightly across the surface. Do not apply pressure to the sander other than the weight of the sander itself. After sanding, open up the tack cloth, bunch it up but keep it loose, then lightly run it across the surface. Too much pressure on the tack cloth will be counter-productive, as this will press the tack cloth's embedded wax onto the surface. Now, the wood should be clean and smooth to the touch. Finish with a final coat of paint. Should you use a paintbrush or a roller to paint wood? The answer is both. Paintbrushes and rollers have overlapping roles in this project, with one tool compensating for the other tool's deficiencies. A good example of this is the technique called back-brushing, in which the roller is followed immediately by the paintbrush to eliminate lines and drips. Rollers cover large areas quickly but they cannot reach into corners. A high-density foam roller will absorb less paint than a conventional microfiber roller cover that is used on walls. This translates to a smoother paint surface, with no discernible texture. Paintbrushes are good at painting corners and edges, but they take a long time when painting large areas. Purchase a quality brush. Stay away from cheap, generic brands, as they may shed their bristles all over your wet paint. Plastic sheeting, cardboard scraps, newspapers, and bed sheets alone do not work well because they are either too slippery or they permit paint to seep through the material. Instead, combine the two. Start with a lower layer of plastic sheeting to prevent the paint from soaking through. The upper layer of a canvas painter's drop cloth or rolls of inexpensive contractor's paper also catches paint, but it is more about providing a slip-free surface for you to walk on. Priming the wood before painting is not just an important step; it separates the professional-grade paint job from an amateur job. Primers are chemically formulated to bond to problem surfaces, and to give paint an even surface to bond to. Primers help avoid problems such as flashing, a condition where areas of the final paint job look as if they were painted with different paint glosses. With flashing, one area may look glossy while another will look flat. Combined, it has a very patchy, unattractive appearance. Use a high-quality primer brand, such as Kilz or Zinsser. Kilz provides several options, including a low-odor oil version. Zinsser provides several selections and also has a shellac-based primer. You can save time and achieve a smoother paint coat by having your primer tinted toward your finish color if permitted by the manufacturer's instructions. Make sure that the tinted primer is not an exact match for your eventual paint color; you just want it tinted in that direction but you do not want an exact match. During the process of painting, you need to be able to tell the difference between your final color and the dried primer. Paint can get tacky and create brush-drag if you take too long while painting. You can either pick up the pace or buy an additive that extends your working time. Penetrol and Floetrol are popular additives that create smoother brush strokes. Avoid painting underneath a fan or heating vent or in open sunlight, as all of these will accelerate drying time and create tacky paint.